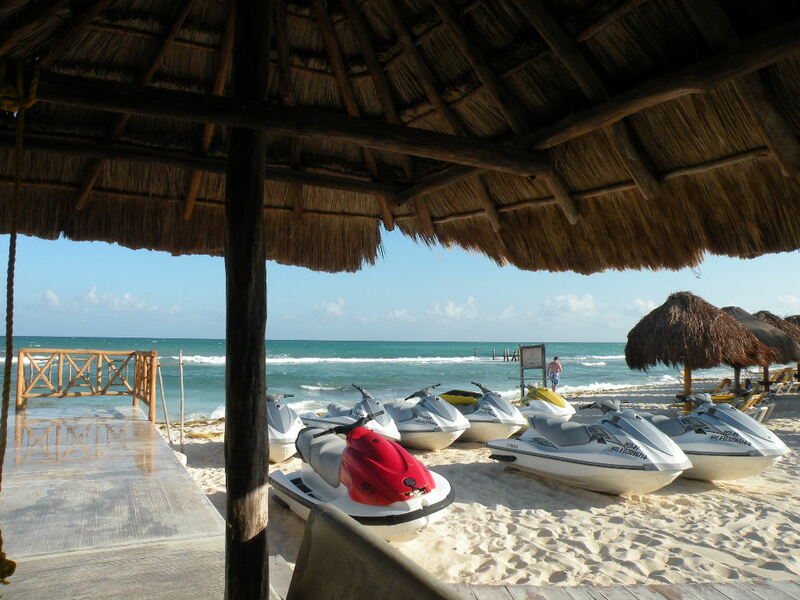 On Wednesday 29 February 2012 I made the short 1 hour 19 minutes flight from MIA to Cancun International in the state of Quintana Roo, Mexico, one of three Mexican states sharing the Yucatan peninsula. It was a bright sunny day, and the flight was so smooth that it felt as if the aircraft hung motionless at 43,000 feet while the Florida Keys and then the turquoise waters of the Caribbean slowly slid by underneath, motion only becoming apparent as we initiated our descent into the Cancun area. From Cancun International airport I made my way to the Iberostar Paraiso del Mar resort hotel on the outskirts of Playa del Carmen, which is really one of five hotels in a large complex in the Riviera Maya that includes a convention center as well as a small shopping mall, an 18 hole professional golf course and driving range. 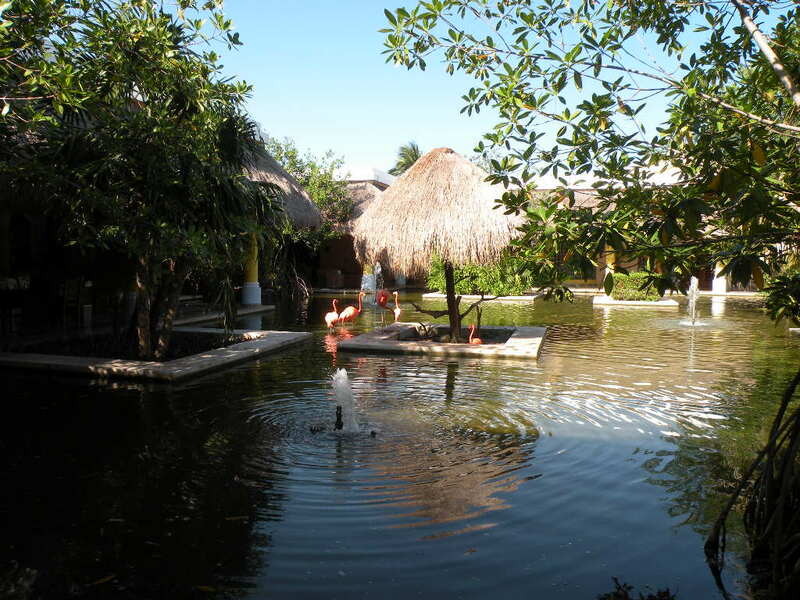 Amazingly, despite the scale and scope of such large complex, one is never aware of it for two reasons: (1) the resort is located in the Municipio de Solidaridad where building height is limited to 12 meters above ground or 3 stories, whichever is less, as a hurricane-mitigation measure, and (2) the various components of the resort complex are well separated from one another and surrounded by luscious landscaping that incorporates a lot of the native vegetation that was there on site, before design work and construction even began. The combinations of these factors and the overall design approach is such that you have this sense of human scale and privacy. For example, the hotel were I stayed has a total of 720 rooms, 12 restaurants including two that easily seat 600 guest each at one time, plus a large lobby area, several bars, a disco-theather, four large swimming pools, tennis courts, a couple of gyms/exercise rooms and other amenities, not to mention a beautiful stretch of sandy beach facing the Caribbean. 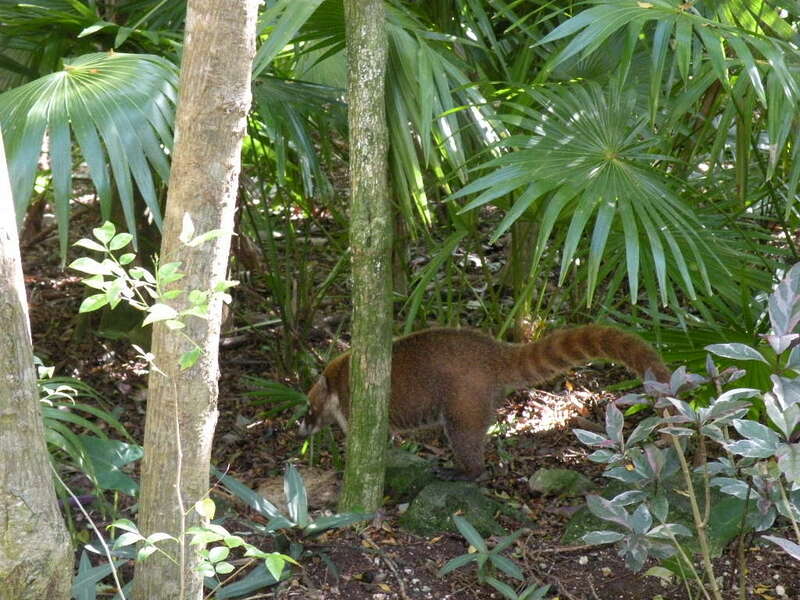 But the guest rooms are divided among 20 small three-story buildings of 36 rooms each, which are distributed in such a way throughout the landscaped site that you never see more than two of these buildings at one time. 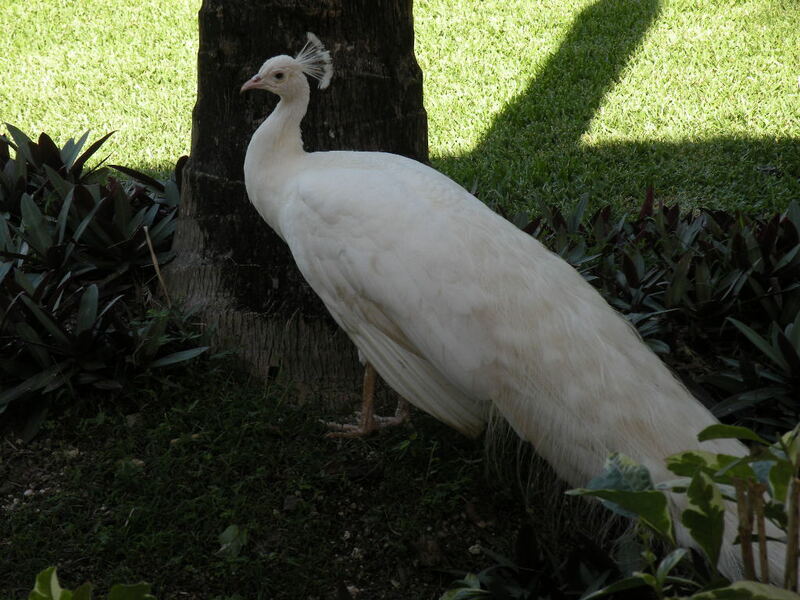 In addition the grounds are populated by local and exotic fauna including, badgers, squirrels, peacocks, flamingos, swans, roosters, cats and numerous tropical birds. I wouldn’t even try to describe the wonderful symphony of sounds of nature that greet you every morning as the sun rises and daylight takes over. Let this lengthy introduction provide the background for me to inform about the purpose of my trip to such a fantastic place. 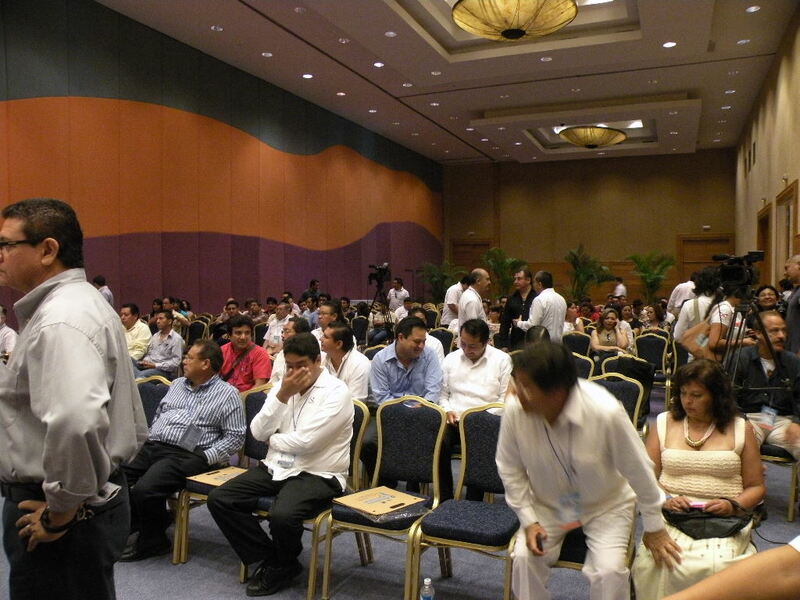 I was invited by the Mexican Federation of Associations of Civil Engineers or FEMCIC, from its name in Spanish Federacion Mexicana de Colegios de Ingenieros Civiles, and the Association of Civil Engineers of the Municipality of Solidaridad or CIC, to deliver the Conferencia Magistral or Masterly Conference – Keynote Address, at their first national conference taking place in Playa del Carmen on 1, 2 and 3 March 2012. 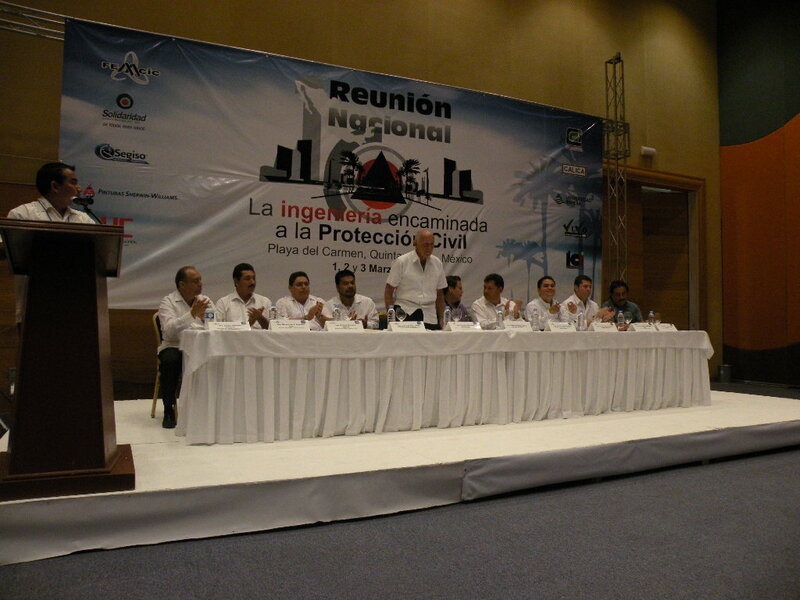 The title of this first national conference was La Ingenieria encaminada a la Proteccion Civil, which translates as Engineering aiming at Civil Protection. In my opinion the whole idea behind this title is that engineering needs to be at the service of emergency management. In my opinion, when you think about it, this was a truly gutsy title given to this event, because my experience has been that building design professionals, engineers and architects, have by and large been absent from the emergency management and hazard mitigation fields in Mexico, in the United States and in most countries. 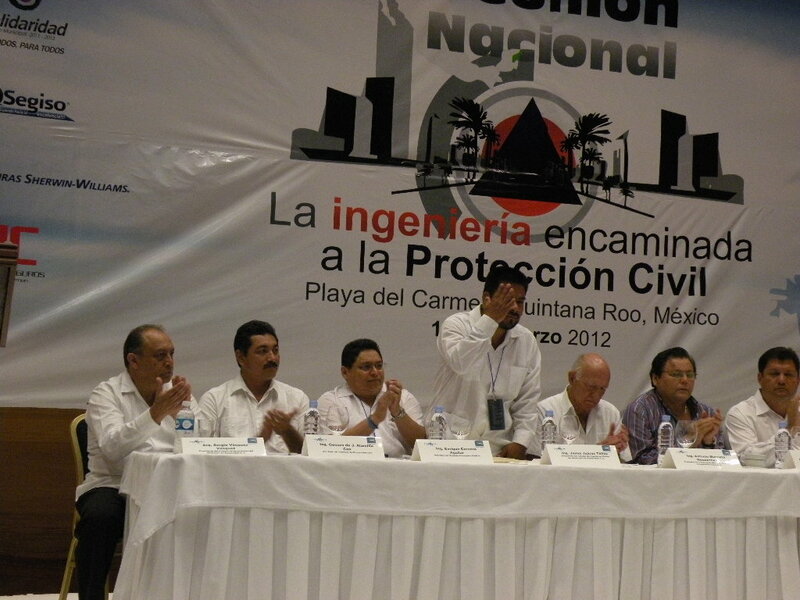 So to now have the leadership of a national engineering society in Mexico and that of the local chapter in the Municipality of Solidaridad, not only organize this important event, but squarely aim it at the linkage between engineering and emergency management, is truly remarkable! Certainly a good foundation for the future and something that may hopefully also take root here in the USA. My conference, which was delivered in Spanish, was titled Caracterizacion del Sitio e Impactos: Herramientas Practicas para diseño anticiclónico (Characterization of Site and Impacts: Practical tools for hurricane-resistant design). The presentation had four specific objectives: (a) Share a series of photos taken by me that show various types of damage caused to buildings, infrastructure and the beach by major hurricanes, which have hit Quintana Roo over the years; (b) Identify problems, damage, and error that keep being repeated by design professionals and residents of hurricane vulnerable communities, involved in building design or in mitigating the impact of hurricanes, to break with past failed approaches and reach for a new paradigm in building design in hurricane-vulnerable locations. To provide context for my remarks I provided data from the International Red Cross that basically tell us that on an average year the impact of natural hazards affect 260 million people, cause 100,000 deaths and $70.0 billion in physical and structural damage to buildings and infrastructure, and asked if these numbers are really equivalent to keyholder rights that humankind must pay and inhabitants of planet Earth? Is this a norm we must accept, or is there something we can do to mitigate such annual damages? I followed these questions by driving the point home that the $70.0 billion in annual physico-structural damage to buildings and infrastructure are not the complete picture, for they are just the tip of the iceberg. These amount of damage does not include deaths, injuries, loss of function and services, economic losses, business interruption and many other negative consequences that are part of the price we pay for the impact of natural hazards. In this regard the main message was that we need to mitigate damage to buildings not because of the cost of each building, but because of the value of the human activity and functions sheltered in those buildings. In light of this reality the message from my conference was clear: substantial, even radical, changes are needed in the criteria and methodology we currently use to design buildings in vulnerable communities. Related to this I also made clear that it is up to design professionals, such as those participating in the event itself, to identify, initiate and implement such changes to achieve the hurricane-resistant design that is needed. My presentation also identified thirteen specific practices that can be adopted by design professionals as contributing factors toward such hurricane-resistant design paradigm. In closing I issued the following challenge: I challenge all of us to once and for all make the decision to break from the tried and used practices, which have resulted in such poor performance. It is in our hands to adopt one, some or all of the specific practices I have proposed, or others recommended by other sources to achieve the hurricane-resistant design that can benefit so many. It is up to each of us as individuals to accept the gaunlet, or to go back to the confort of the old and known in our daily practices, leaving it for future generations to finally decide to reduce the potential for damage from hurricane impacts, or be the ones blaming us for for our lack of courage to take action.